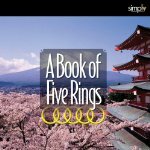 A Book of Five Rings is one of the three great historical strategy books, accompanying The Art of War and The Prince. They are best appreciated when listened to together. As the Japanese consulted Demming from MIT after World War II about quality American style, the Americans began to study Musashi's A Book of Five Rings in the 1970s when the Japanese. Keep your eye on the ball; focus on your goal single-mindedly and more.